This is a very serious problem – if your car overheats for too long, you can damage your engine. As soon as possible, find a safe place to pull off the road and shut the engine off! Do not attempt to check the fluid level in the radiator; the hot fluid can cause severe burns. The best thing to do is have your car towed to Yeck's Auto Repair. Everyone in Bellevue Nebraska does our best to budget for scheduled vehicle maintenance. What's hard is planning for unexpected car repairs. The truth is that our vehicles can stay on our Nebraska roads longer than ever before with proper maintenance. That's because of improved vehicle design and manufacturing quality. But some of those same improvements also lead to higher repairs costs for every car or vehicle. There's a tool that can be found on Edmunds.com that you can use to prepare your Bellevue Nebraska service and repair budget. It's now paid for and you'd like to keep it running for the next three years. You can go to Edmunds' True Cost to Own calculator and enter your vehicle's data. 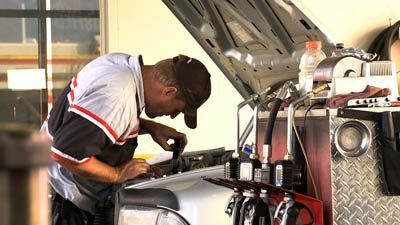 The calculator will provide estimates of what it'll cost to service and repair your vehicle in Omaha over the next five years. The estimate's based on where you live in Nebraska, manufacturers' recommendations and repair experience for your particular model. Of course these are just estimates - there's no way to predict what'll actually happen to the car in your driveway, but it's a good starting point. The calculator also has estimates for depreciation, financing, insurance, Nebraska taxes and fuel costs. Let's focus on maintenance and repair in the Nebraska area: This table at Edmonds.com shows that the average monthly cost of maintenance and repairs for our example in Nebraska is about eighty-three dollars. That may sound like a lot, but compare it to a new car payment. Some folks in the 68005 zip code area are afraid of what can go wrong with their older car so they buy a new one. That's fine if you really want a new car, but if you properly maintain your older vehicle, you'll save a lot of money on new car payments and insurance. It just makes good economic sense when times are tight in Bellevue. Give us a call for additional advice on how to keep your car running on a budget. A brief message for our preferred customers. Happy Holidays from our family at Yeck's Auto Repair to your family. The most misunderstood indicator in your car. Are you feeling vibration in your steering wheel or seat, it may be because your tires are out of balance. Be sure your Belts & Hoses are in good condition. Must you service your air conditioning system on a regular basis? Watch the video for tips on keeping your AC in working order. Video tips on proper air pressure and tire rotation. Brake problems may be avoided with regular check-ups. Ignoring your cooling system may make you hot! A fuel filter could stop your car cold. An easy way to avoid $3,000 in auto repairs. Keeping up your car's fuel efficiency can save you money. April is National Car Care Month. Prepare your car for the upcoming warmer temperatures of summer. It's not only Brakes that stop your vehicle, avoid costly brake repairs by having the brake fluid flushed. October is Fall Car Care Month. Prepare your car for the upcoming cooler temperatures.